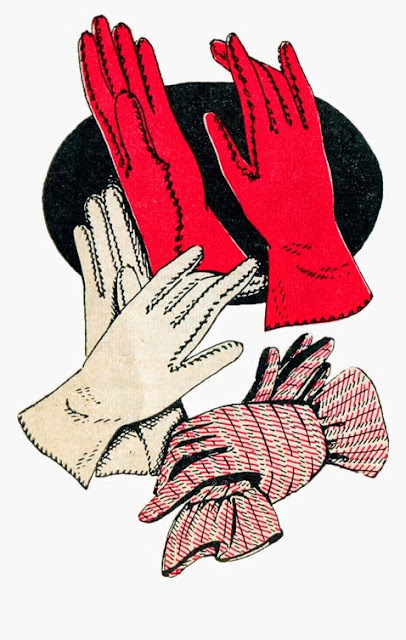 Make your own gloves from a 1950's free vintage pattern in pdf file format. This file has patterns to enlarge and tutorials to get you through the sewing process. I can see this used for awesome glove and costume projects, so save yourself a copy now because you never know when you'll want to use it! You'll find that free pdf file HERE on PatternPatter.blogspot.com. The pdf file alone is HERE. While I'm at it, I want to credit the original designer of these gloves, Edith M. Hummel, who wrote about making gloves in her book: "You can make your own gloves", 1946 and about accessories in: "You can make your own bags and accessories", 1952 and 1957. This pattern appeared in the January 1956 issue of Workbasket Magazine. Her books may still be available in long established libraries. Retro Styled Swimwear: Super Bowl Inspired!